Can I Give My Rabbit Banana? Yes, but you must do it sparingly. Banana peels are safe, too. As a treat, you can give your pet rabbit fruits which can include bananas, apples, cherries, apricots, plums, pineapples, mangoes and berries. 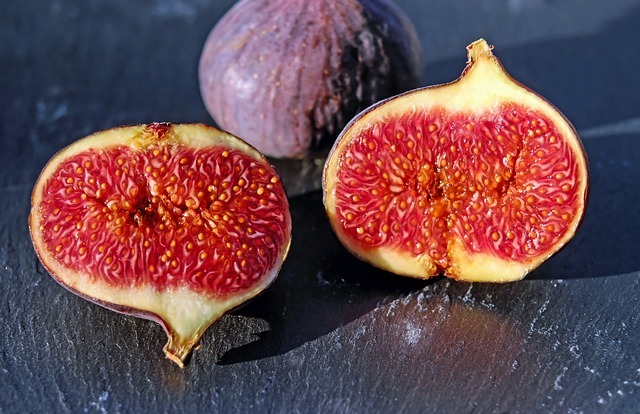 These are just some of the limited and safe choices of fruits that you can feed your pet bunnies, but as a precaution, it is best to ask your veterinarian first before feeding other kinds of fruits that are not mentioned. Banana peels are practically safe too for your pet rabbit, but feeding them with these sparingly is essential. Also you must thoroughly wash them before giving them to your rabbit. There are a bunch of rabbit owners that are quite amazed with their pet rabbit’s rather odd penchant for bananas and banana peels. Rabbits should not be given a piece of banana larger than an adult’s thumb. For rabbit owners, keeping a healthy bunny is important. It is a responsibility that pet owners around the world should work on since the general wellness and disposition of their pets reflect significantly on them. Rabbits are not probably the easiest pet to keep. They need to live only indoors and they need your time and attention for different fun exercises. You need to be there to change his litter box, his water bottle/bowl, to clean his cage, to offer him only fresh vegetables. For all his activities, the recommended size for the living space is at least 12 square feet (6ft x 2ft x 2ft for the HUTCH + 8ft x 4ft x 4ft for the RUN — minimum measurements according to the Animal Welfare Act). 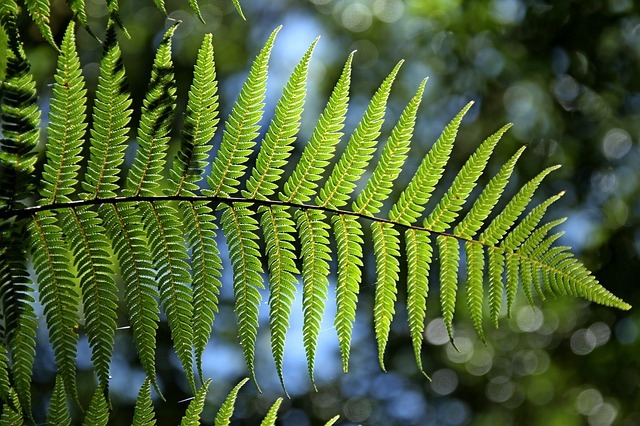 Aside from giving them their freedom to roam around your porch or sprawl over your garden, part of their general wellness is indicated by the food that they eat. Rabbits, like any other pet, must strictly abide by a diet that ensures their health is intact. 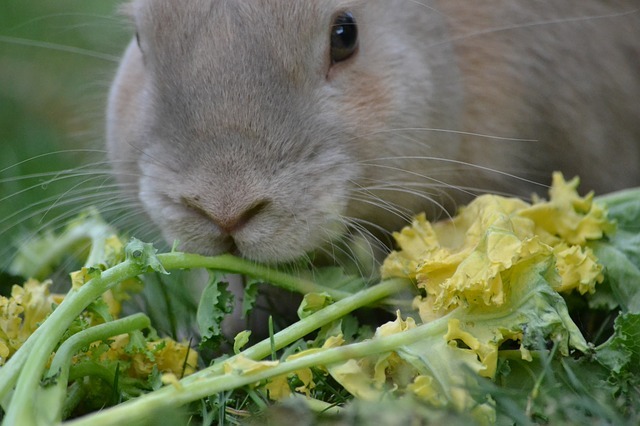 Small portions or small pieces of green leafy vegetables such as alfalfa sprouts, arugula, asparagus, kale, lettuces, cabbages and the like must be fed to rabbits twice a day, and root vegetables and fruits must be given to them only as a treat. What are the repercussions when bananas are fed to rabbits constantly and taken in excess? 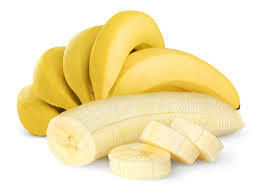 Firstly, bananas and its corresponding peels are starchy. Starchy food can significantly harm a rabbit’s set of intestines and other organs. As a lagomorph, their intestines are designed to digest cellulose and not food products high in fat and carbohydrates. 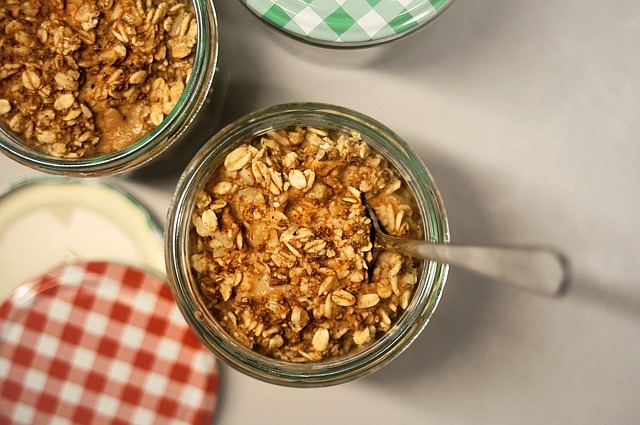 As much as you need to control portions of their bananas and banana peels, you definitely need to limit such as snacks and not as a meal replacement. 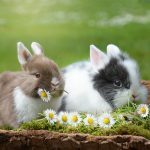 If you let your pet rabbits overindulge in bananas, banana peels plus crackers, bread, cereals, seeds, nuts and the like, you might have to deal with runny stools, cecal dysbiosis, obesity and other health problems related to poor digestive tracts. 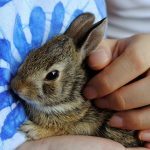 Not only will it be discomforting to deal with for your pet rabbit, but it can also cause them their deaths. Secondly, you have to be aware of a single piece of banana’s sugar content. 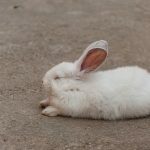 Aside from the starch component of sugar that will make it hard for your pet rabbit to digest, you have to stay in control of your rabbit’s physical energy. You cannot send your rabbit on a sugar rush as it will be hard for you to keep up with them. 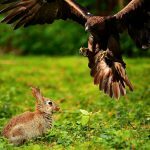 Aside from the obvious fact that it is already hard to chase after a running and galloping rabbit, shooting their energy reserves high can be detrimental to their physical health. A pet rabbit can survive and live long on a spare diet. A thumb-sized piece of banana packs on a lot of carbohydrates and sugar, and giving them anything in excess to this minuscule serving is detrimental. Thirdly, feeding rabbits too many bananas the risk of interchanging treats with meals. 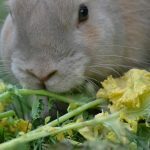 When pet rabbits suddenly lose their natural penchant for green leafy vegetables, which they are required to take in order to live and start to beg for bananas and banana peels instead, you are taking away their potential for a long and healthy life. Never confuse your rabbit’s diet by giving them too many snacks than what their main course should be. If they do lose their appetite over their greens, you will definitely have a hard time ‘wiring’ them back to a herbivorous diet. What are the rules when feeding fresh food for the first time? 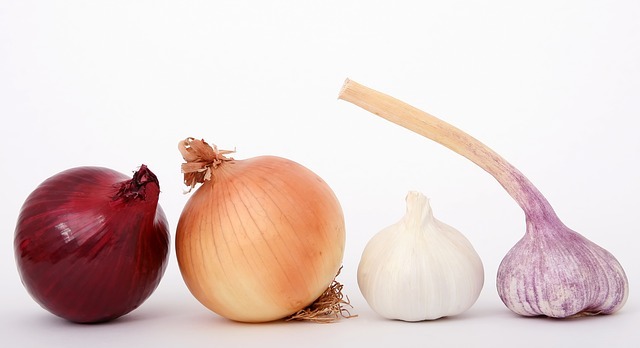 Wait until your little furry friend is at least 3 months old to introduce any vegetable. It’s a must that before trying any vegetable he has been eating hay for at least 2 weeks. Try leafy vegetables before trying any fruit. Don’t introduce more than one type of fruit at a time. Same rule for veggies. Give your rabbit time to adapt. Wait for 24 hours to see his returning answer. If your rabbit shows signs of soft stool or an upset tummy, then stop feeding the fresh food, and offer only hay and water for a few days. If everything is fine you can feed him again in a week or so. Keeping a rabbit healthy rests on the owner’s responsibility. It is not as if rabbits can arrange the food they need to eat all by themselves. Even if you have a healthy lawn and small vegetation patch in your garden where your pet rabbit can help himself to his greens, the point is, anything a rabbit takes in excess is potentially dangerous to him. A rabbit that is bored and a rabbit that lacks stimulation will tend to overeat. Overeating among rabbits is a destructive and dangerous habit. If there is that tendency to overeat, play with your rabbit often. Let him have his play time in your yard and stock up on hay instead of feeding him dry greens. 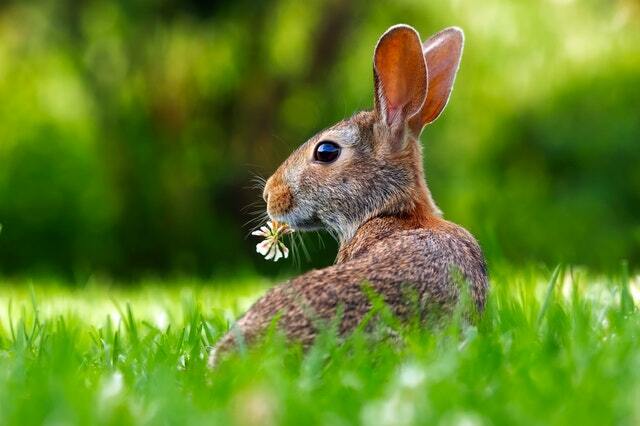 The more your pet rabbit consumes hay, the better it is for him to maintain a healthy digestive system. Lots of greens, like Parsley, Mint, Dill, and Romaine Lettuce, the darkest green you can find. I heard that giving them lettuce is not good for them, I’m not an expert though so i would do some research to be safe. what age can they have bananas? or anything other than pellets/oats/hay? My bunny fought me like a ninja when I ate a banana in front of him. He use to be nice to me but now he takes my food and makes me eat his pebbles.. please help. Please note that rabbits can NOT eat iceberg lettuce as it is extremely posionus to them. They should be around six months, that is when they should be fully grown.